(Reuters) - Gold slid 1 percent on Tuesday to its lowest this year, as a string of robust economic data boosted demand for riskier assets like equities, with bullion further weighed down by gains in the U.S. dollar. Spot gold was down more than 1 percent at $1,274.41 an ounce as of 10:19 a.m. EDT (1419 GMT), having earlier slipped to its lowest since at Dec 27 at $1,272.87. U.S. gold futures also shed over 1 percent to $1,277.30. "We're likely to see some more pressure on gold over the next couple of days, especially with earnings coming out that's going to keep the equity market stronger," said Bob Haberkorn, senior market strategist at RJO Futures, adding bullion is also being weighed down by strong Chinese data and a better-than-expected U.S. job report last week. Indicating strong appeal for riskier assets, Wall Street equities climbed on better-than-expected results from healthcare giants, adding to an upbeat momentum in global equities driven by robust economic data from China and improved sentiment in Germany. The dollar also gained, making the metal more expensive for holders of other currencies. Investors are now waiting on Chinese gross domestic product (GDP) numbers for further cues on global growth. A Reuters poll forecast first-quarter growth to have cooled to 6.3 percent, the weakest pace in at least 27 years, but a flurry of measures to boost domestic demand may have put a floor under slowing activity in March. "If the data comes out south of 6 percent, it will be enough to rally gold, but anything north of 6 percent will keep gold on the defensive," Haberkorn said. Also, bullion could see a bounce later in the week on bargain hunting with "traders waiting for more downside to go," he added. On the technical front, gold's break below key support levels, including the 100- and 50-day moving averages, signalled further downside to prices, analysts and traders said. 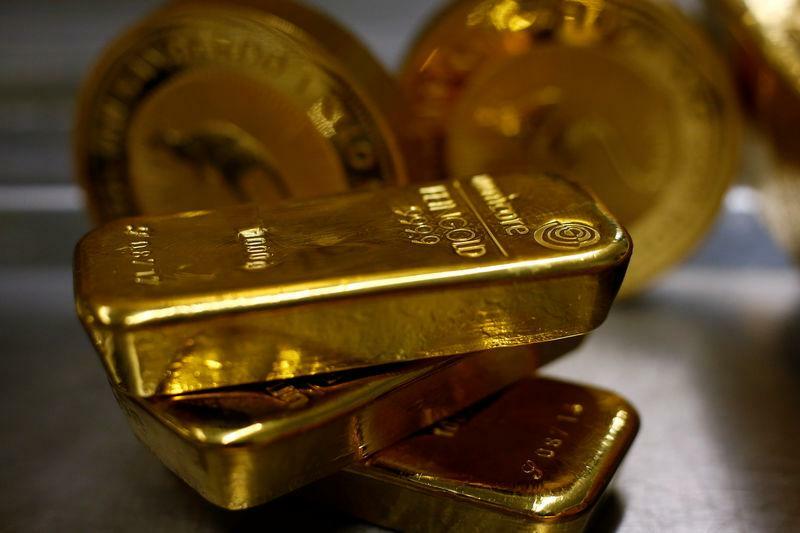 However, overall sentiment for bullion was turning positive with increasing central bank buying likely to provide a cushion for prices, Standard Chartered analysts said in a note. Among other metals, silver dipped 0.4 percent to $14.94, having hit $14.81, its lowest since Dec. 26, in the previous session. Spot platinum fell 0.6 percent, to $879.70 per ounce. Palladium however, was the sole gainer, rising 0.1 percent to $1,362.55. A sustained deficit in supply of the auto catalyst metal, which had pushed prices to a record high of $1,620.53 last month, was likely to deepen further this year and in 2020, Standard Chartered added.